This is the second recipe of Ina Garten's that I've tried, and another winner! It is so delicious, my kids love these! Even my daughter who does not like nuts in her cakes, do not mind these, me included! Ina's Garden, a new blog hop, which consists of six wonderful ladies, who are cooking and baking from Ina Garten's recipes sure picked another winning recipe. The smell of this bar when being baked in the oven is unmistakenly the wonderful smell of peanut butter! I must confess, that I am not overly fond of peanut butter when spread on bread, but use it in a baking recipe, it is a different level altogether. If you have a jar of peanut butter and a jar of your favourite jam, go make this! The dough is soft and crumbly, really delicious. I use raspberry jam as per the original recipe. The tanginess of the jam against the buttery soft and not too sweet dough are a perfect match. The addition of the peanuts adds a wonderful flavour and crunch! For the full recipe, please drop by Yummy Chunklet or here. I made only half the recipe, with half of all the ingredients, except for the sugar which I used only 100gm (about 1/2 cup) and I baked in a 8" square pan, about 35 minutes. The sweetness is just right. I'm linking this lovely bars to Yummy Chunklet. 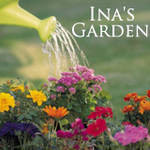 Find out what's cooking next at Ina's Garden. Join in the fun, it will be a delicious one! Joy, these look scrumptious! I love peanut butter, eating a peanut butter and jelly sandwich almost everyday for my lunch at work. So you know that I will love these bars. Thanks for letting me know the recipe is easily reduced by half. In this house I am the only PB lover! Your bars look fabulous! And I love the color of your raspberry jam against the soft brown of the peanut butter. Yum! Fantastic post! Thanks for joining us in Ina's Garden! Btw, I've added you to my Google Reader, and I look forward to reading your future posts! Wow I think kids would love this recipe! What a combo! Mmm, the way you described this..i wanna take a bite! i'll be making something of peanut butter too in the next couple of days, hope it will turn out successful! I have never been disappointed in any of Ina's recipes. They are all delicious! These bars have already been on my list to bake as well. Glad to hear they are tasty. Thanks! If I make these bars, I wont stop munching them ~ looks insanely addictive! Delicious. I do like Ina Garten's recipes and this peanut butter and jelly bars look scrumptious! Will have to check out Ina's Garden. They sure look very inviting. Thanks for the delicious idea! Excelente barra y que ricos todos los ingredientes se ven estupendas ,una gran galleta para los niños,cariños y abrazos. Sorry, we visited the children on Mother's Day and I had not seen the comments. I deeply regret that he had problems with my blog, but in reality 3 times, I got your comments! Thank you very much for your beautiful words, I hope to go to these gardens! Beautiful and delicious recipe !!! I love so much the Peanut Butter !!! Excellent and very irresistible bars, yumm! I love peanut butter, even on bread! This is such a great twist on the classes PB&J, I wouldn't stop at eating just one! I love the name "Ina's Garden" :) These bars from Ina sound wonderful. Her recipes always are. I'm a big fan of Ina too. Peanut butter and jelly is always a classic hit! And these bars are fantastic! Ina. She really is one of the best. Your bars turned out great! I love the raspberry jam...mmmmm! Thank you so much for baking Ina's Peanut Butter and Jelly Bars along with us. Yours look delicious, and I think it is a very good idea to reduce the sugar as you did. They were very sweet, so I am sure it would not have affected the taste at all, and it would make them a bit better for us :) The other ladies from Ina's Garden and I do thank you for your support, and we hope that you will join in with Pasta with Pizzaz - the theme for next Thursdays Ina's Garden gathering. Any Ina pasta recipe is fine. Thank you so much for joining in. Thank you for stopping by and all your lovely comments. Hope everyone will have a wonderful and delicious weekend!